The Holy City of Varanasi, where life and death are intertwined with such complexity, is best described as India on steroids because this is where a lot of everything happens! Varanasi is loud and chaotic, both dirty and spiritual, very tiring and so incredibly raw. With all the places to visit in Varanasi, things to do, and emotions to experience, you might as well plan for more time than you think necessary! Emotions run riot in India’s Holy City as you dodge large cows, and watch the dead burn, whilst the living bathe in the sacred (yet incredibly polluted) Ganges. The Varanasi ghats are some of the most important places to visit in Varanasi, where activities such as cremation, bathing and ceremonies can be observed. 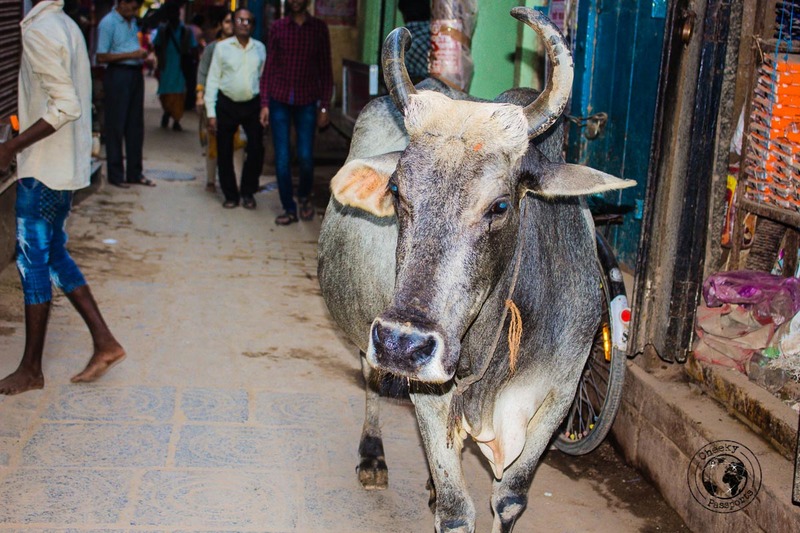 Holy men linger inside the temples in Varanasi, whilst holy cows roam the streets. Goats bleating, dogs barking, bells ringing in a medley accompanied by vehicle horns and so much colour in every nook and cranny within the narrow winding lanes. People chanting as they carry corpses to the burning ghat in one of the world’s oldest cities. These are just some of the intense experiences to be had in all the places to visit in Varanasi. 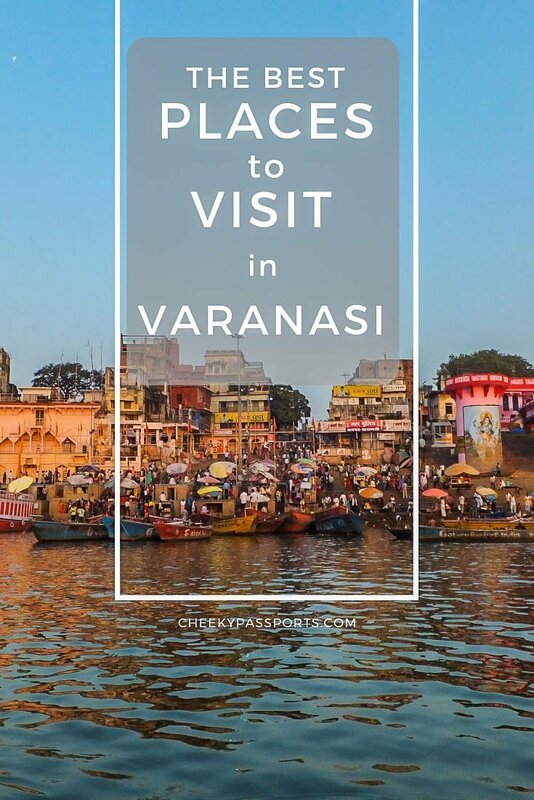 You can expect to encounter all of the above during your visit to Varanasi but if that sounds overwhelming, don’t worry, here’s our guide to the best places to visit to visit in Varanasi, how to get there, staying safe and other helpful tips! 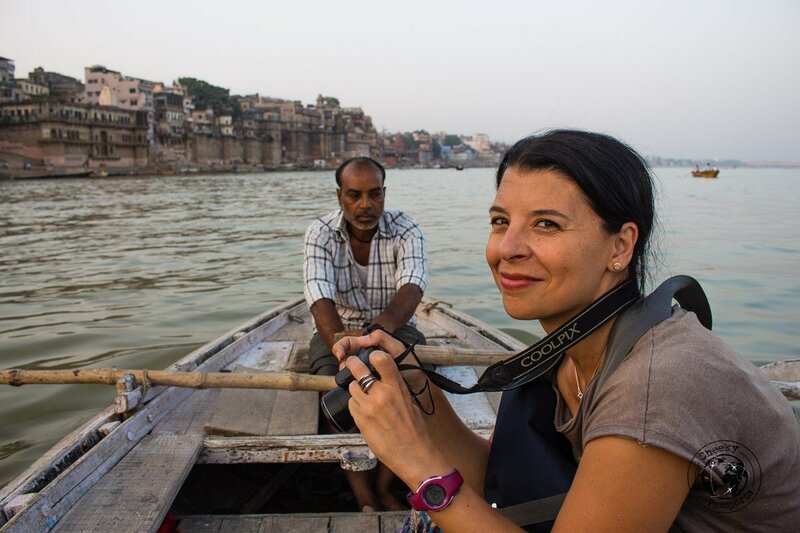 Having trouble booking flights to the Varanasi? Choose Kiwi! Ghats are essentially docks or quays distinguished by flights of stairs leading to a body of water. 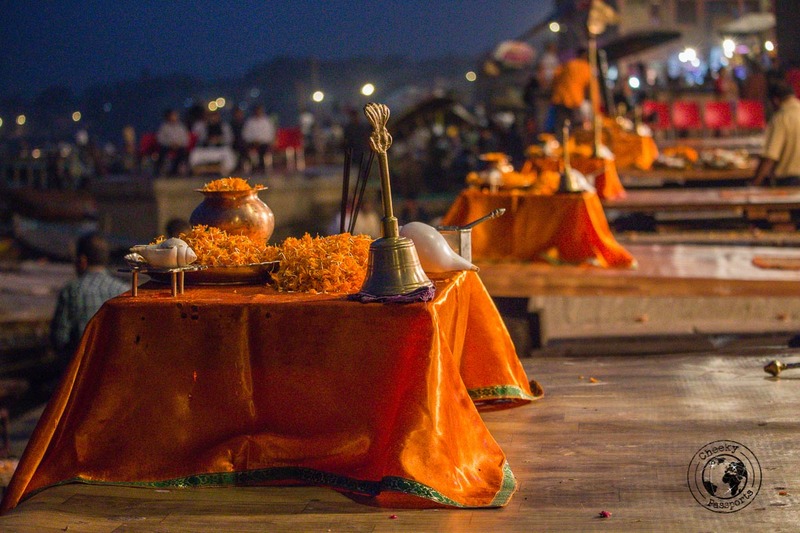 There are 88 Varanasi ghats that lead to the sacred Ganges with some being used specifically for certain activities, whilst others are privately owned. When you’re looking for the best places to visit in Varanasi, the Varanasi ghats should be at the top of your list. 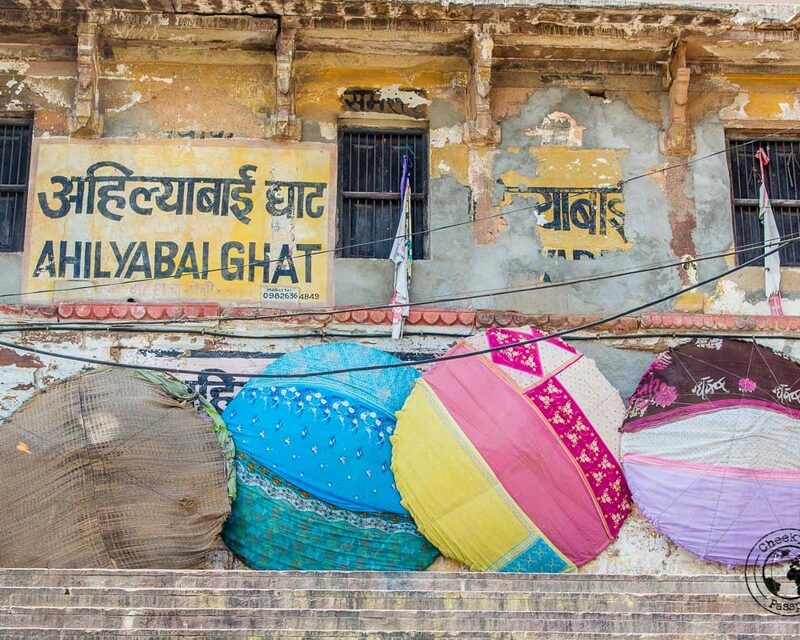 It is of course not practical to visit every one of the Varanasi ghats in a short time period, so here are the ones that should most definitely make it to your list! 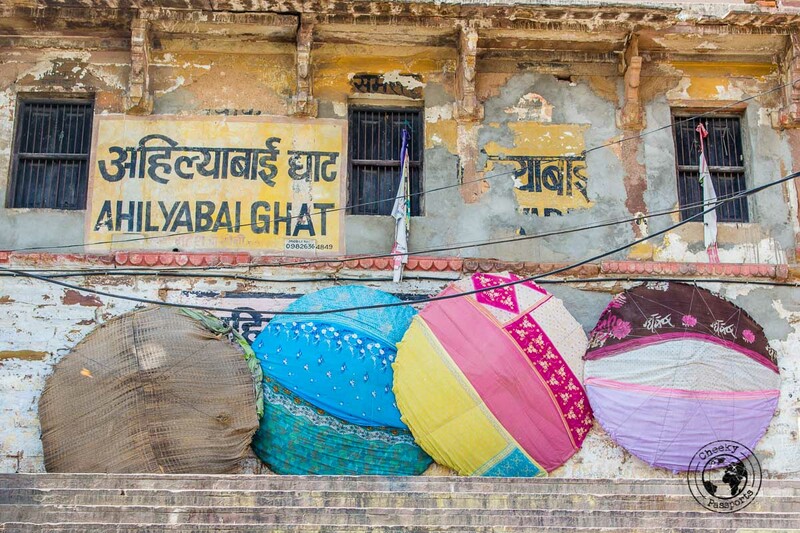 You can find the names of the Varanasi ghats marked on Google Maps or Maps Me, and proceed to make your way there on foot from the city’s narrow winding roads. Alternatively, it is sometimes possible to walk from ghat to ghat in order to avoid getting back to the city. Sunrise and sunset boat rides by the river banks are also a great way of observing life on the Varanasi ghats from the water itself. 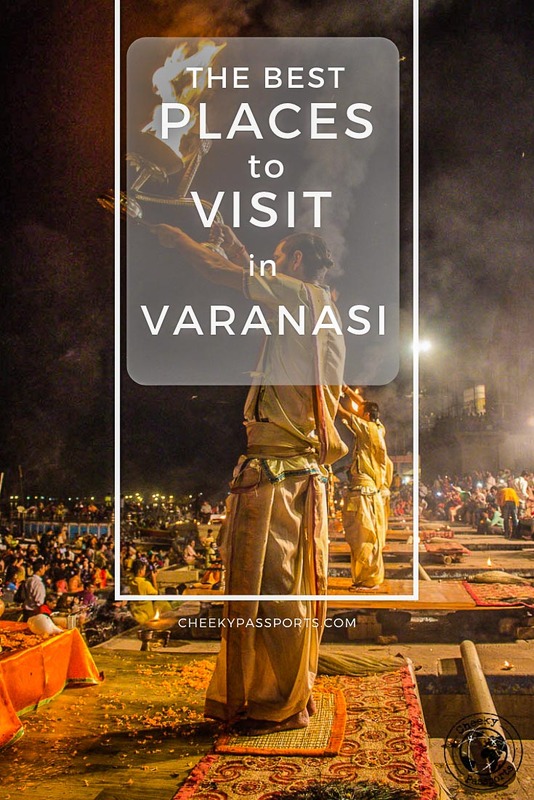 By far the busiest of all the Varanasasi ghats and the location of the beautiful Aarti ceremony (more on that below), Dashashwamedh Ghat is the main ghat in Varanasi. 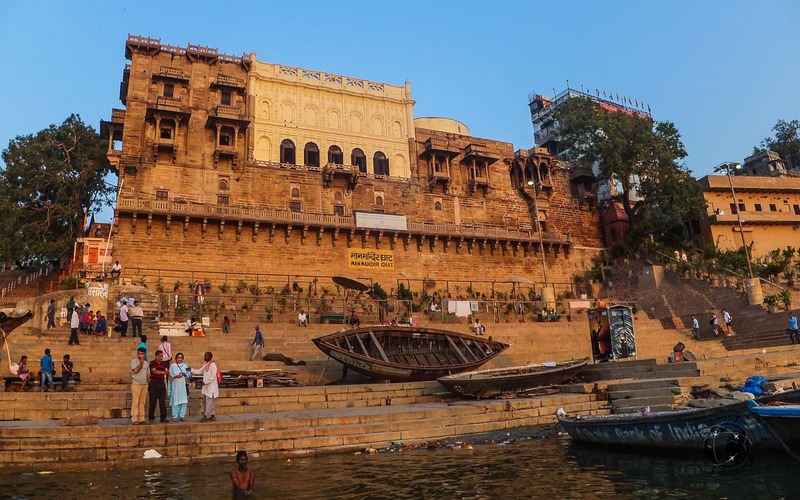 Dashashwamedh Ghat is also one of the oldest of the Varanasi ghats and is the subject of two legends, the more popular one being that Brahma sacrificed ten horses at this ghat. 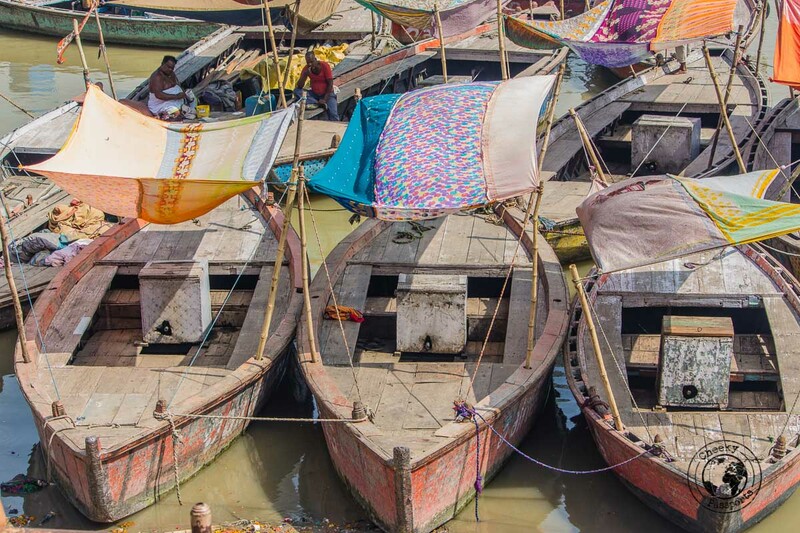 Put Dashashwamedh Ghat at the top of your list of places to visit in Varanasi. This is where you will see the colours of Varanasi come to life. You can easily choose a shaded spot on the ghat and watch everything happening down below! Be aware that because of its popularity, plenty of sellers and touts are based at Dashashwamedh Ghat – they will most probably bother you every five seconds, so unless you want to avail yourself of their services, keep walking past and ignore them. If you strike up a conversation, you might find it rather difficult to get away. 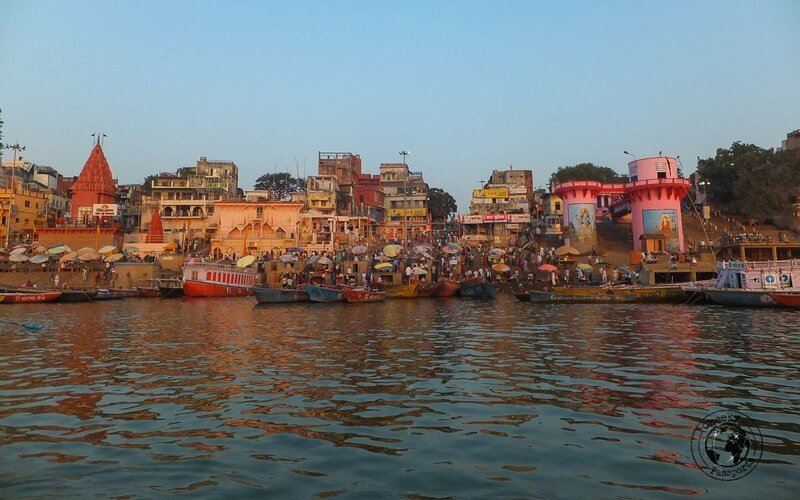 Also known as the burning ghat, this is perhaps the most ‘difficult’ of the places to visit in Varanasi, since it is where the majority of cremations take place. 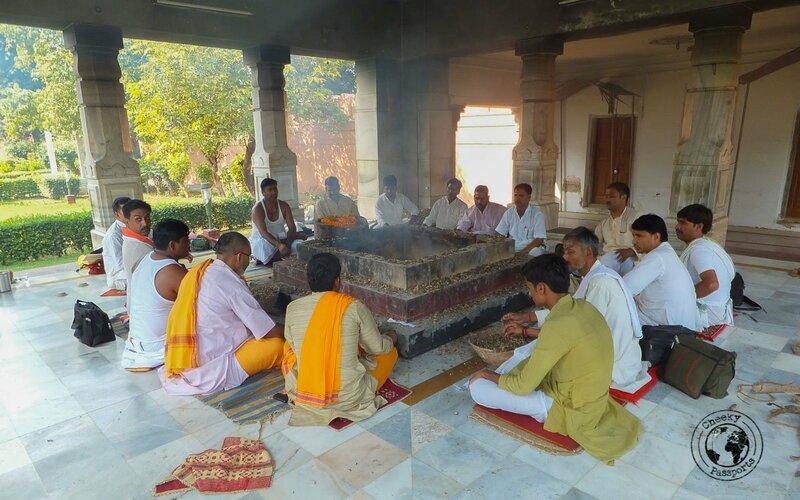 It is considered favourable for Hindus to be cremated here, thus many elderly and sick people come to spend their last days in Varanasi to finally be cremated at the banks of the Ganges. Observers can watch cremations, but it is very important to show respect and maintain distance from the cremation area. You should know that although the corpse is initially wrapped in cloth, much of it comes undone during the cremation process. Photography is not allowed. Watching a human body burn may be emotional or uncomfortable to some, especially when the cremation area is surrounded by dirt, and rats and cows are freely allowed to rummage through the surrounding scraps of cloth. Manikarnika Ghat is one of the most somber places to visit in Varanasi, although it is a deeply spiritual place for Hindus. Young children, holy men and pregnant women are not cremated, since they are considered to be already pure, but are simply dropped in the Ganges after being weighted. Lepers and people who died from a cobra bite are not cremated either. Manikarnika is not the only burning ghat – Harish Chandra Ghat is a smaller ghat where cremation also takes place. Do be aware that the Ghat is subject to various scams from unscrupulous people. It is common to be approached by an individual claiming that you are being disrespectful and that you need to pay them money so that they can take you to a viewing point which is more ‘respectful’. They might also tell you that they will report you to the police as one guy did to me (he didn’t notice Nikki a few meters behind me), for which reason I couldn’t fathom! When I basically told the tout to sod off and that I should be reporting him and not vice versa, he accused me of being rude ‘to a man’ implying that I’m only a woman and had no right to do so! I laughed in his face and told him once again to sod off, whilst he was very surprised when Nikki tapped on his shoulder and informed him that actually HE is the man, whereupon the advice to sod off was obeyed. 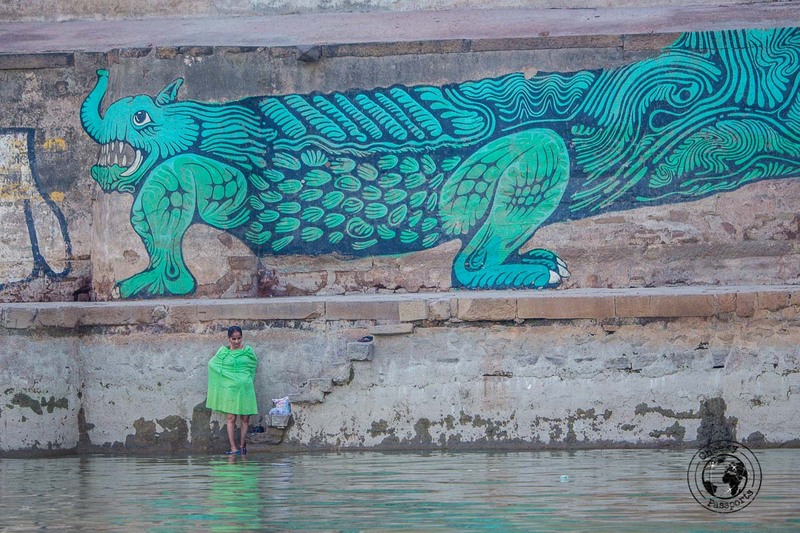 Safe to say that the tout got scared and we never saw him again during our time in Varanasi. The importance of Assi Ghat lies in its position: this is where the river Assi meets the Ganges. Assi Ghat is also one of the livelier of the Varanasi ghats with many activities such as yoga sessions taking place here. It is a good place to go if you’re looking for a boat ride since many start off at this spot. Be sure to bargain the initially requested price down though! The observatory at Man Mandir Ghat is what puts this ghat on our list of places to visit in Varanasi. 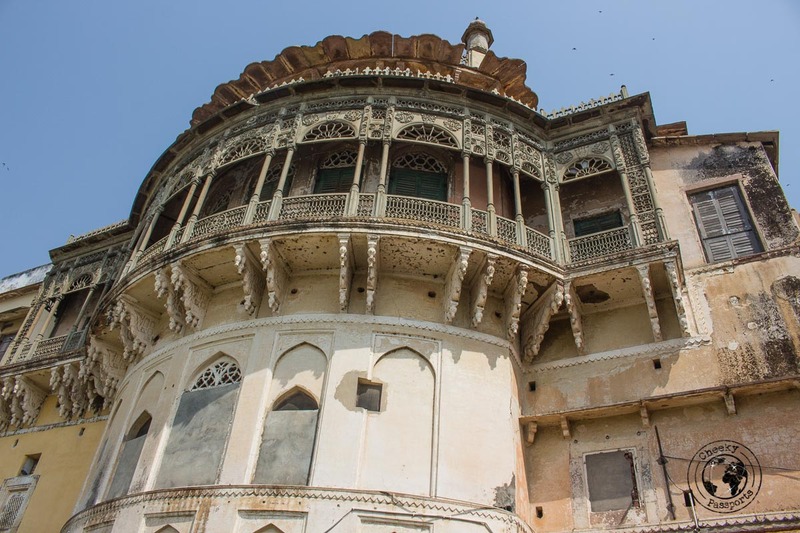 The ghat’s upper levels contain beautifully carved balconies and windows whilst the roof contains an observatory similar to (but smaller than) those found in Delhi and Jaipur. Hindus believe that waters of the Ganges are holy and bathing in them is considered to be an auspicious activity. The waters may or may not be holy depending on your faith, but they are certainly very dirty and polluted, and we really do not advise you to follow their lead. Being a Holy City, the temples in Varanasi are some of the main attractions among the places to visit in Varanasi. The Golden Temple is possibly the most popular of the temples in Varanasi. The temple is located within the narrow maze of lanes in Varanasi and there are often long queues to get in. Bags, shoes, watches, phones and all electronics are not allowed inside the temple, but a number of shops and outlets on the roads leading up to the entrance contain lockers in which you can store them, for a fee of course. Foreigners need to take their passports because of a registration process in which they are checked. Be sure to carry the passport along with you – you will not be allowed in without! Security around the temple is tight and supposedly only Hindus are allowed inside, but we were let in when we politely confirmed that we would like to experience and learn about Hindu culture. 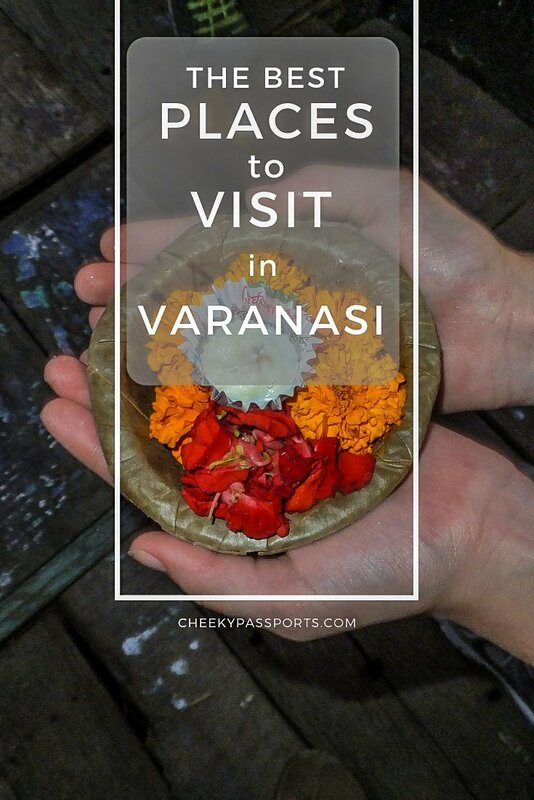 As a non-Hindu, the experience was interesting but underwhelming since it was all so very rushed, however we do understand that this one of the holiest places in India for Hindus and one of the most important places to visit in Varanasi. The Monkey Temple gets its name from a swarm of monkeys that are said to occupy the areas around the temple. We didn’t see any though! 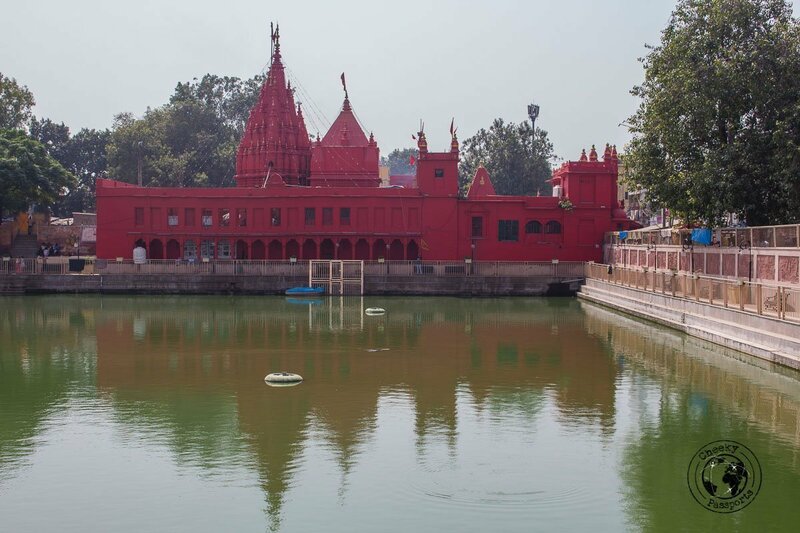 A pond is located right next to the red temple which supposedly used to be connected to the Ganges at some point. We had intended to get into temple, but were put off after standing for ten minutes in a very long, non-moving queue! We had been told that no photography is allowed inside though we never made it in, so we are unable to confirm this as a fact. Located at Kedar Ghat, this temple can be accessed by walking up the ghat steps after taking a boat or directly from the city. We only saw the temple during our boat ride on the Ganges, but it seems to be very popular among locals especially because of its Shiva Linga. The Sarnath temple is actually located in the town of Sarnath rather than in Varanasi itself. We explain more about Sarnath below. The University claims to be the largest residential university in Asia. Whether this is so or not, it is certainly very large and home to the New Vishwanath Temple complex. The University is very clean, rather peaceful and built in a unique style with beautiful architecture. A great place in which to get away from the hustle and bustle of Varanasi! Sarnath (also called Isipatana), is located a few kilometers away from Varanasi and is mostly famous for its Sarnath pillar of Ashoka. It is also popular for having been mentioned by the Buddha as one of the four places which his followers should visit, besides being the site of the Buddha’s first teaching after attaining enlightenment. Many of the ancient buildings and structures at Sarnath were damaged or destroyed, but we thought that the ruins and remaining structures were pretty interesting, and the peaceful walk in the park was a welcome break from the chaos of Varanasi! • Muglagandha Kuti Vihar (Sarnath Temple) – a pretty Buddhist temple built in 1931 maintained and run by the Mahabodhi Society. A golden Buddha statue sitting on a marble platform can be found inside. Frescoes adorn the walls showing scenes from Buddha’s life. 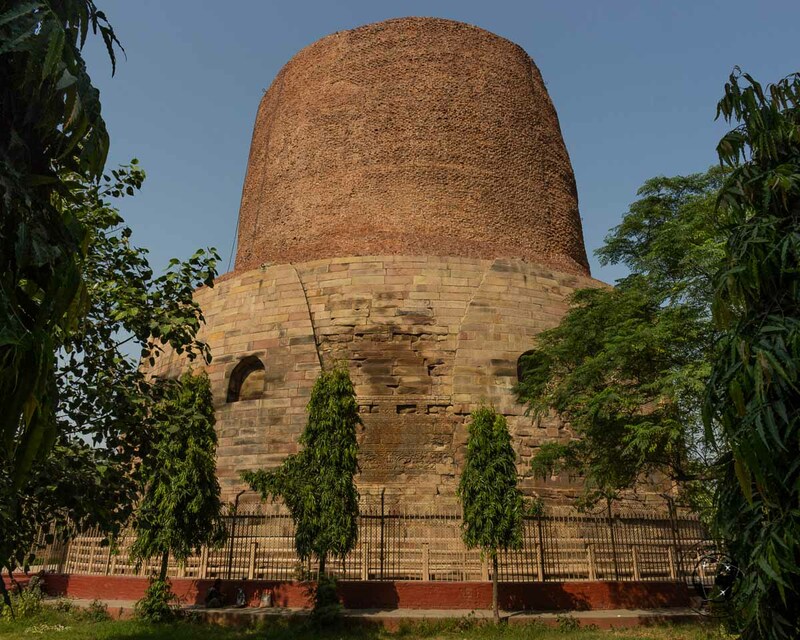 • Dhamek Stupa – the most imposing attraction among the things to see in Sarnath, the ancient stupa marks the spot where Buddha gave his first sermon and revealed the path leading to Nirvana. The entry to the ruins complex and the Dhamek Stupa costs INR 300 (about €3.70) for foreigners. • Sarnath Pillar of Ashoka and the ruins complex – the remains of the Sarnath pillar of Ashoka can be found within the ruins complex (see above for entry fee) which also includes the ruins of four ancient monasteries. The Sarnath pillar is one of the most important of the pillars built by the Emperor Ashoka during his reign and records his visit to Sarnath. The Sarnath Pillar of Ashoka used to stand over 17 metres high with its capital, which depicts four lions back to back, and which has now been adopted as the official symbol of India. • Jain Temple – the little Jain temple in Sarnath is an important pilgrimage site and is of particular significance for believers in the Jain faith. 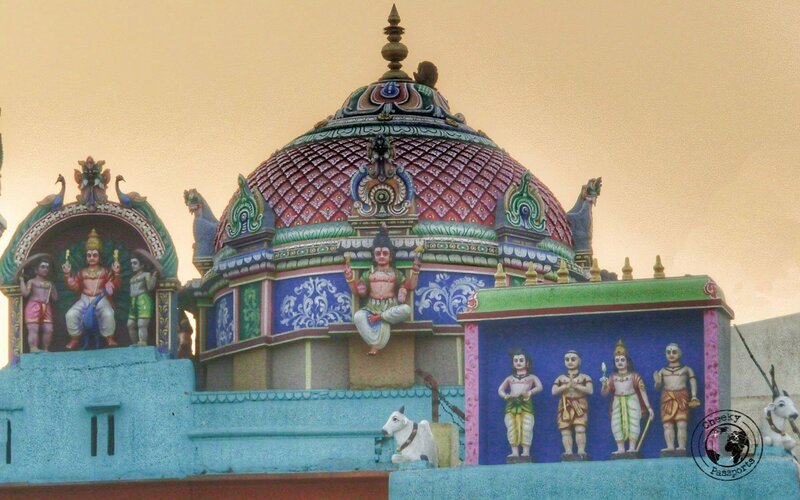 We thought that it is not as beautiful as other Jain temples in the country though! • Statue of standing Buddha – a very large statue located near the Thai temple besides a very large, well-curated garden. It is India’s tallest standing statue of Buddha and a very popular attraction in Sarnath. • Deer Park – this is located right behind the Muglagandha Kuti Vihar and seems to be a popular place for family picnics and walks, with trees and gardens. Sadly, we didn’t have time to take a look around. 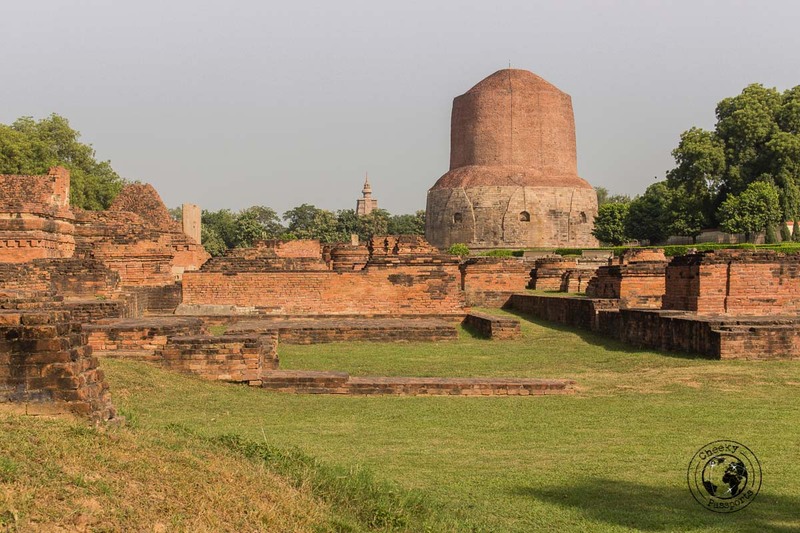 • Chaukhandi Stupa – this important Buddhist stupa is a little bit far from the other Sarnath monuments. It is said to mark the spot where Buddha met his five ascetics. It is best visited on a day tour of Sarnath. A return tuk tuk with waiting time (half a day) from near Assi Ghat in Varanasi cost Rs 500 (about €6) with lots of bargaining and a break-down of the vehicle on the way back! A second tuk tuk was called to take us back to Varanasi whilst the original tuk tuk was pulled behind with a rope, almost doubling our commute time! 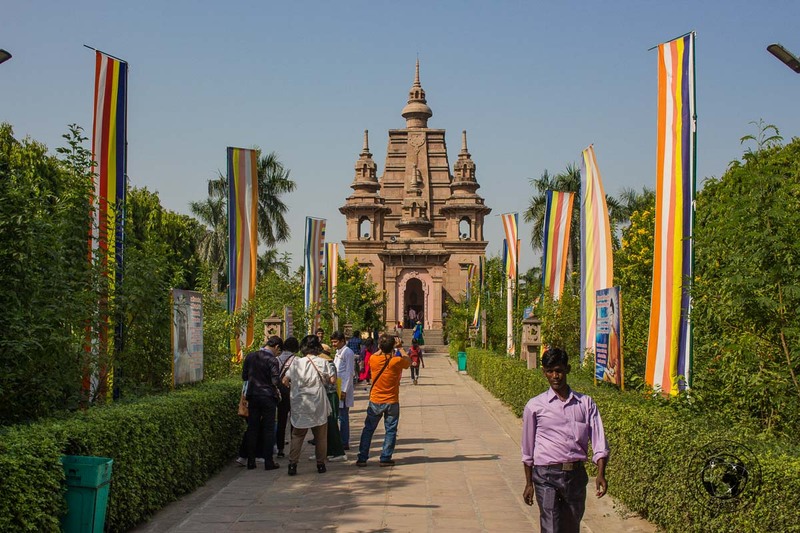 If you would like to visit Sarnath as part of a private tour in more comfort, you can choose from several offered here. Ramnagar Fort is far less popular than the crowded Varanasi ghats. 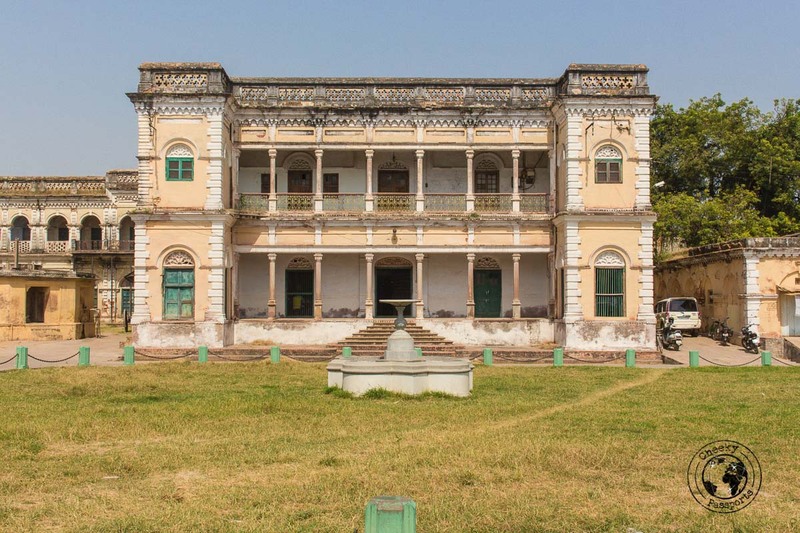 Quite frankly this is not surprising since it is rather dilapidated and underwhelming and hardly one of the most imposing forts in India as has been described elsewhere! Yet we thought it looked rather pretty from outside, and it also houses a small collection of classic but badly kept cars amongst its very dusty exhibits. Although the fort is not one of the more popular places to visit in Varanasi, it does contain however, a very large, ancient mechanical clock which still shows the correct time of day and which we found to be rather fascinating! A return tuk tuk to Ramnagar Fort from near Assi Ghat with about an hour’s waiting time cost Rs 150 (about €1.80). Entrance to the fort is Rs 300 (about €3.70). The Aarti evening ceremony is the main activity you should witness in Varanasi. 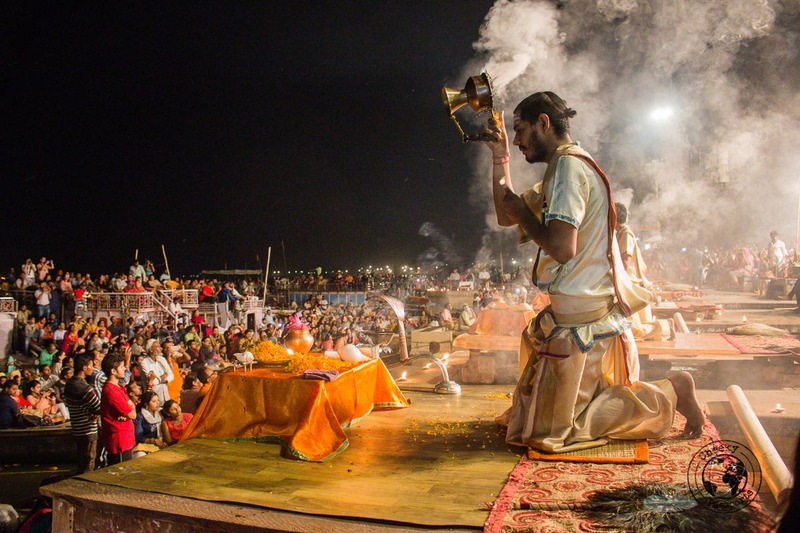 The ceremony is held daily at the Dashashwamedh Ghat at sunset and is about 45 minutes long. The timing changes with the change in season. You can watch from a boat (against payment) or at the ghat itself (for free) but you need to get there early if you would like to find a good spot to watch the ceremony from. 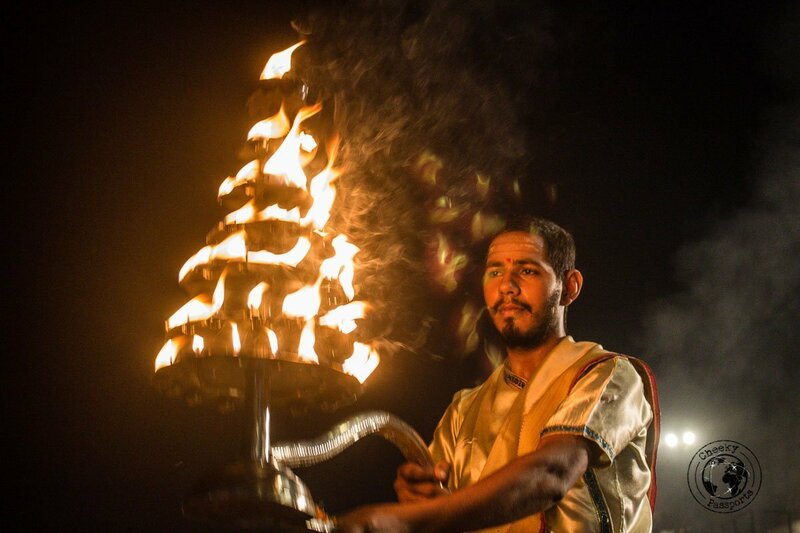 The ceremony involves a group of pandits (Hindu disciples) chanting hymns as they perform the rituals with incense, conch shells and oil lamps. Spectators will place floating lamps on the Ganges so that it lights up in a wonderful display of brilliance. It is a beautiful, spiritual spectacle to experience and should not be missed! If you would like to avoid the confusion and watch the ceremony as part of a tour, they can be booked here. Sunrise and sunset boat rides are some of the most popular things to do in Varanasi. They tend to be rather relaxing when compared to land activities in the chaotic Holy City. A sunrise boat ride will allow you to watch the ghats come to life in the morning as the sun rises in all its splendor over the Ganges. We assure you that it is totally worth the early wake-up call! A sunset boat ride on the other hand, will allow you to observe life on the ghats as dusk falls over the river. Sunset boat rides are typically followed by the Aarti ceremony, so you can tell the boatman that you would like to watch the ceremony from his boat, at an extra fee of course! Assi Ghat is a very popular spot from where to find a boat. Bargain hard for good price! Our private sunset ride cost Rs 400 (about €5) for an hour, but we think that we could have bargained it down to a better price had we arrived there earlier! 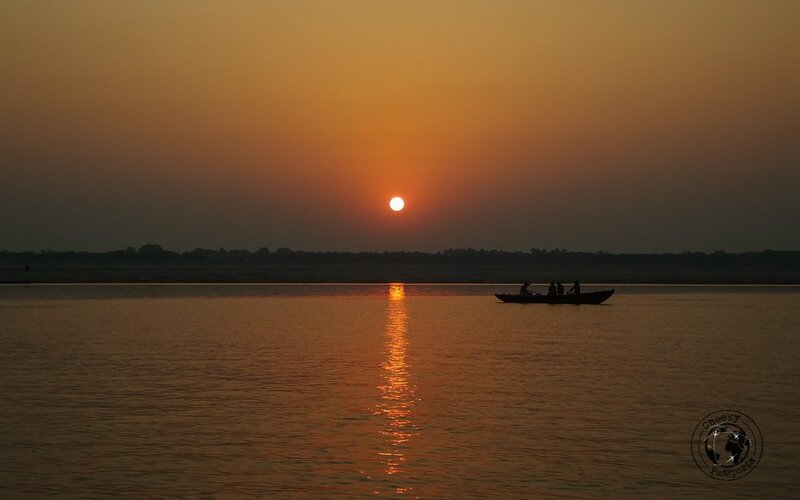 Private sunrise and sunset boat rides on the Ganges can be booked here if you would like to avoid bargaining and have the boats pre-booked. Indians may be more inclined to try the famous Banaras paan, however as a foreigner, I wanted to have a go at it myself, despite the fact that after having tried paan in different parts of India, I had not really developed a liking for it. 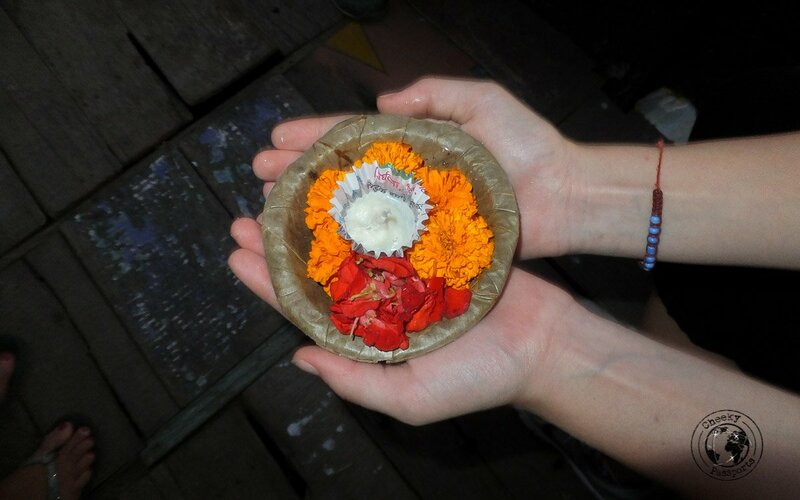 Paan combines a betel leaf and areca nut with other flavours and is normally chewed for its psychoactive effects. The preparation is addictive and may be harmful when consumed regularly so we are definitely not encouraging its prolonged consumption! Despite having tried a few paan preparations in India, I did not feel any of alleged euphoric effects, as opposed to what I experienced when I chewed betel nut is West Timor. In India, a paan preparation may include fillings such as candied fruit, raisins, cardamom and saffron among others. 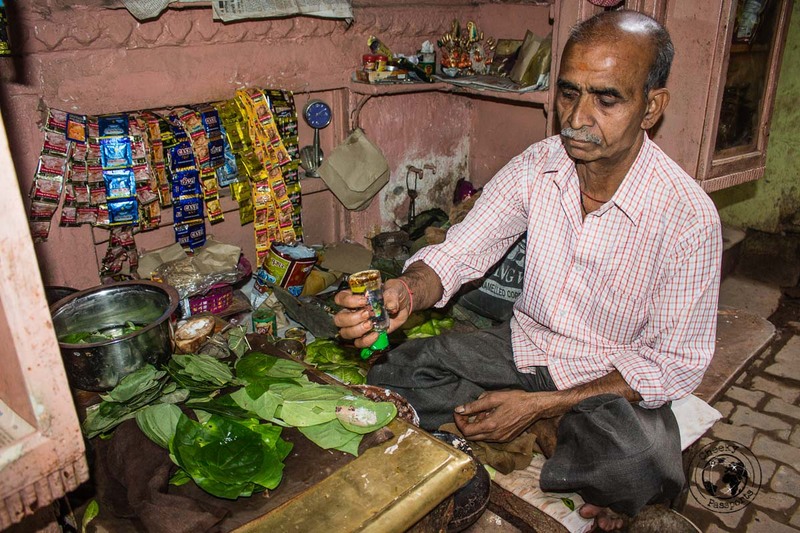 Making good paan is considered to be a skill, and we have been told that presenting visitors with paan is a sign of hospitality in Indian homes. Banaras paan is said to be among some of the best in India, but I can safely say that I still didn’t develop a taste for it in Varanasi. Note that chewing paan (or other betel preparations) can lead to adverse health effects including cancer. The preparation is addictive and should not be consumed on a long-term basis. It is illegal in some countries. Make an informed decision about whether you would actually like to try it out. The Holy City of Varanasi can be accessed from different parts of India in several ways. Delhi is a popular starting point for a trip to Varanasi, with various transport options available in getting from Delhi to Varanasi. Direct trains from Delhi to Varanasi can be booked via the IRCTC website or more easily (if you’re a foreigner and do not feel like undergoing the complicated IRCTC registration process) via 12Go Asia’s website. A train journey is typically over 15 hours. Overnight sleeper buses ply the Delhi to Varanasi route. They can also be booked on 12Go Asia. Flying is definitely the easiest and quickest, but more expensive option of getting from Delhi to Varanasi. Check the latest flight prices and book here. Varanasi is home to several eateries and restaurants to suit all tastes and budget. Being a popular destination with tourists and foreigners, several western food options are available. Seeing that we were about to travel to the more remote North East regions of India, we took the opportunity to get our fill of “tourist” food when we were in Varanasi! The buffet breakfast priced at Rs 350 (about €4.30) is not to be missed if you’re hungry! We actually ate this for brunch and we didn’t feel like anything else for the rest of the day. The menu is very long and versatile including also a great cheese platter which we had for dinner one day. The bakery is also home to a guesthouse which can be booked here. Located close to Assi Ghat, this little eatery serves good western breakfasts including cereal, oatmeal and good coffee! 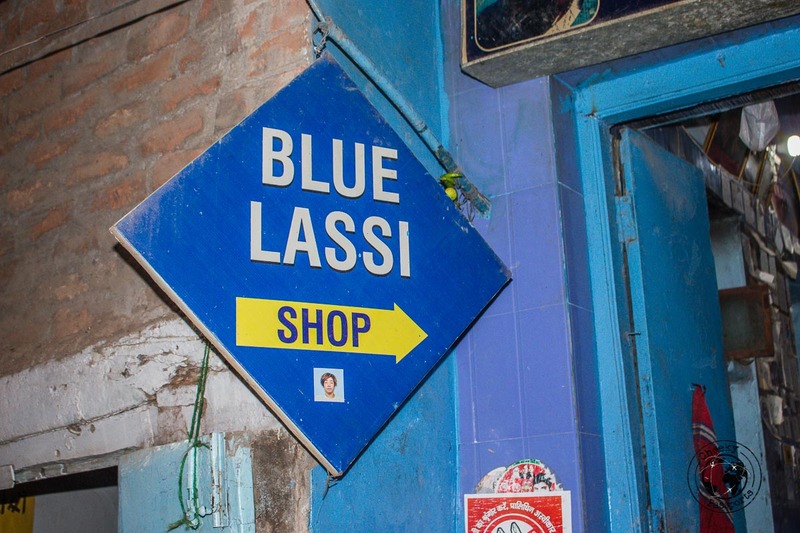 There’s nothing western about lassi, but Blue Lassi caters mostly to foreigners who come to savour its famous lassi in crowds, probably due to the lassi shop being located close to the burning ghat and having been featured on Lonely Planet too. 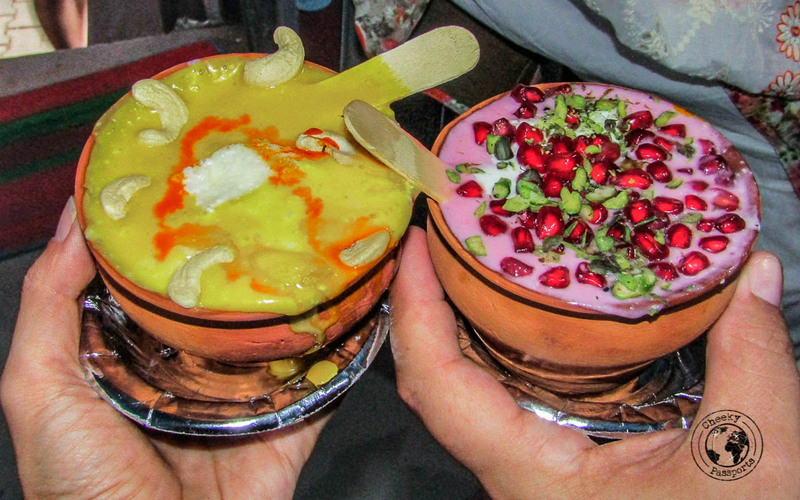 The lassi served here comes in different flavours and looks very pretty. Despite being a tourist “food”, it actually tastes pretty good with servings priced at around Rs 80-100 (€1–1.25). Lake View Hotel is a budget accommodation located close to Assi Ghat which we rather liked. The place was clean and the manager very helpful! If your budget allows, Diwedi Hotels Sri Omkar Palace is a good mid-range option, whilst if on the other hand you are looking for luxury, Taj Nadesar Palace is a good choice.